My favorite time of year is summer. It is warm, days are long, evenings warm and weekends filled with cookouts with friends. As holidays roll around or weekends get filled with invites I always ask, what can we bring? Normally it is something the hostess has in mind but lately it has been.. Sanj bring that orzo salad. This recipe is so easy and so good. I got it from a friend of mine and alter it each time I make it but only when I was ready to do this post did I read this is a traditional Colombian breakfast. This lends itself for a meal any time of year. It has orzo pasta which can be hearty but with more arugula and lemon added it quickly lightens up for a summer dish. 1. Cook Orzo until al dente or however you like it. It will soak up a lot of water and puff up so make sure to have a full pot of water. I used 2 lbs in this recipe and filled my pot up. 2. Strain orzo to remove exces water. Pour into a large pan or cookie sheet so it can cool off. 3. Immediately drizzle with olive oil and stir so it does not stick. 4. 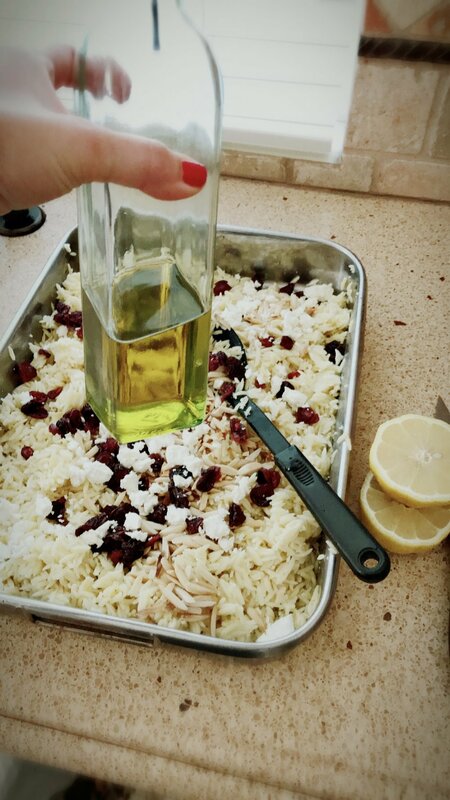 Let cool until pasta is no longer hot then add in feta cheese, dried cherries or cranberries, pine nuts or almonds and feta cheese. 5. Squeeze the juice of lemons. 6. Add arugula and season with salt and pepper. 7. As you toss it, taste and continue to add olive oil, lemon, salt and pepper until you get to the flavor you like. 8. Serve it if ready to eat. If not you can refrigerate. Voila you are done. This dish is tasty and keeps so well if you make it in advance. Sitting overnight works well for this dish. I add more lemon and olive oil the next day after seasoning has had a chance to already soak in. Yummy and a crowd favorite! Try using different nuts, fruits, fruit juices and cheeses in this dish. It is easy to customize based on your taste. Play with it and find your favorite. Let them see you be awesome and sparkle with this tase treat in hand!